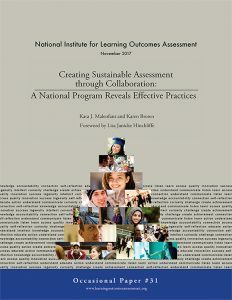 The National Institute for Learning Outcomes Assessment (NILOA) announces the release of “Creating Sustainable Assessment through Collaboration: A National Program Reveals Effective Practices” in partnership with ACRL. The occasional paper was written by Kara J. Malenfant, ACRL Senior Strategist for Special Initiatives, and Karen Brown, professor in the School of Information Studies at Dominican University, Illinois. The full paper is available online. “Creating Sustainable Assessment through Collaboration” synthesizes the results of ACRL’s Assessment in Action: Academic Libraries and Student Success (AiA) program, which involved over 200 campus teams led by librarians designing, implementing, and evaluating an action-learning project that sought to strengthen the competencies of librarians in campus leadership and data-informed advocacy. The paper looks at the collaborative practices advanced by the AiA program (made possible in part by the Institute of Museum and Library Services) and explains how these practices promote assessment aligned with institutional priorities, encourage common understanding among stakeholder groups about attributes of academic success, produce meaningful measures of student learning, create a unified campus message about student learning and success, and focus on transformative and sustainable change. Library research consultations boost student learning. “The Assessment in Action program was a groundbreaking examination of the impact of the library on student success and the furthering of institutional goals. This paper is a compelling look at why these practices worked and how important it is for librarians to collaborate with other stakeholders on campus,” says ACRL Executive Director Mary Ellen K. Davis. “Creating Sustainable Assessment through Collaboration” goes on to show how the AiA experience can serve as a framework for designing assessment approaches that build partnerships and generate results for improving student learning and success through action research, and that the program results demonstrate how libraries contribute to fostering broad student outcomes essential to contemporary postsecondary education. The assessment practices that emerged from the AiA projects can be implemented in a variety of institutional settings and with varying campus priorities. “We are delighted to showcase the power of collaborative efforts to assess student learning and understand the diverse learning environment that emerged from the AiA projects. It is clear from these efforts that librarians are a valued and integral partner to enhancing student learning,” says NILOA Director Natasha Jankowski. The report is available as a free PDF for download online. This entry was posted in Assessment in Action, Publications. Bookmark the permalink.